Had to put this puzzle down and pick it up a few times to finish. Maybe it’s just me, but it seemed trickier than most Sundays. Interesting derivation of CHAPEL and FRACAS. “Fracoso” in Spanish means “failure”. I’m sure there’s a connection there somehow, but I can’t think of one. Brawling…failing? As successful as paypal is, it’s amazing to me that other companies haven’t entered that market. If any have, they’re small enough that I don’t know who they are. Where has everyone been the last 2 days? I think that I scared folks away over the past few days by making some clumsy changes to the comment form. I’ve been trying to address complaints about inflexibility in the commenting process, and have instead demonstrated my lack of ability when it comes to blog design! Yes, Jeff. That 5-minute “edit/change” clock for comments is that best that I can could come up with, without making more fundamental changes. We’ll see if that works. I am hesitant to inflict more changes after foisting such a big redesign on everyone a month or so ago. Almost finished today, but got stuck on heaRts/Rices and aVid/reVoke. All in to me was ABED. Pinot NOIR first, the GRIS. Still alive and somewhat kicking 🙂 I got hung up on ELIN because when the cross clue asked for Yeats’ home, I assumed the answer would be the Irish version that Yeats would use, i.e. EIRE not ERIN. Eventually was forced to accept the latter in order to complete. Good puzzle. 64D: I have never heard the word “knit” used to mean heal, broken bones or otherwise. 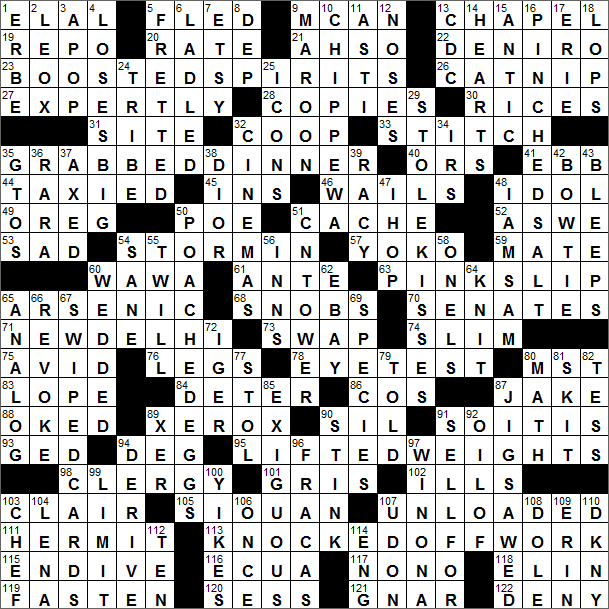 I started following this blog when I started crossword puzzles back in December of ’15. I do have to say you are the Leonard Maltin of crossword puzzle clue/answer reviews in that if it something newer/different in the past 30 years I can’t wait to see how much you dislike it. It’s a game now…I can’t wait for “PokemonGo” to be an answer in the LA Times crossword. Oh it doesn’t sit well with me either. I still have a flip phone so a lot of these smartphone clues I accept on hearsay. Are there other Canadian posters on here? I do my best picking up what I can from Jeopardy, but some of these clues about past US judges and cabinet positions are my biggest hurdles while filling these out. I had HOISTED for BOOSTED because setters do some strange things, and could have put in APIP. Strange things such as OREG. I live in Oregon/Ore/OR. I do not live in Oreg, nor do my neighbors. Oreg grows nicely in my herb garden, though. bones and torn muscles knitting goes way back , but gnar? What am I missing? Aha! Got it! S’new! Like it! Hey, funny thing: had to do this puzzle online; started off GREAT!! Ran thru five or six answers, all correct!! But no….The Times has changed the interface. Used to be a wrong letter automatically showed up in red; mine were all black so I thought “Cool!! I’m acing this! !” Turns out that now you have to select in advance for wrong letters to show up red. I’d missed most of what I thought was correct!! Talk about seeing red!! If I may: I really think this was a bad puzzle. JAKE and GNAR, really bad, but some of the abbreviations were just soooo ridiculous!! OREG, ECUA, and SESS??! Terrible! I ended up making extensive use of the “reveal” feature. BTW, if you’re doing the puzzle online and there’s a word you know, you can save time by just letting”reveal” fill it in!! Of course, it’ll affect your score, but that doesn’t matter to me, so I did that. Bill, many thanks for the link to “solving times, day by day.” It’s cool that fellow did that. In other news: WHO IS THAT NICE LADY WHO ISN’T ME BUT SHOWS UP WHEN I CLICK ON MY NAME??! !